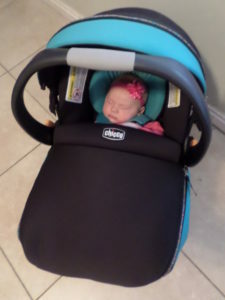 With the birth of my new baby I was in need of a new infant carrier seat and was looking at a lot of different options. I have never had a Chicco brand carrier before, but they were kind enough to send me their #1 rated Chicco KeyFit® 30 Zip to try out. 1- Easy in and out of the base. I have had car seats in the past where the latch would constantly get stuck and it was a tug-of-war to release the car seat every time. This one clicks in and out with ease. The base installation is made easy. From the easy way the buckle loops through, to the ReclineSure® Spring-Loaded Leveling Foot with the RideRight® Bubble Level-Indicators on each side of the base to indicate accurate angle in vehicle seat, as well as its SuperCinch® One-Pull LATCH Tightener to help achieve a tight and secure fit– they didn’t miss anything. 2- Sturdy design. Another thing I hated about previous cars seats was the sun shade design. They were flimsy and would constantly dettach or they would just fall down and never stay in place. This one has a high-quality, sturdy design. It stays in place nicely. The whole car seat is just sturdy. And the cover is attached firmly. Previous car seats would have a million little elastic straps to hold the cover on and they would get stretched out and stop working after a while. This one is made to stay in place without all those annoying little elastic straps. 3- It is designed for my baby’s comfort. You can tell they definitely had your baby’s comfort in mind when they designed this car seat. The click in point has a soft material surrounding it so that the metal parts won’t burn your baby in hot weather. The arm straps have soft covers to protect the straps from rubbing your baby’s neck. The newborn insert (which is a great feature) has a head surround that provides ample support for your newborn’s head. 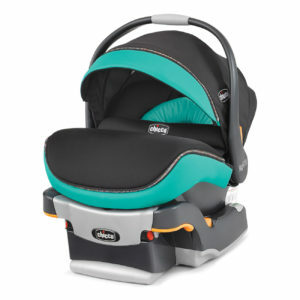 The seat pad the baby sits on nestles your baby in place with energy absorbing foam cushions for their comfort. Just a really well thought out design. 4- Easy to clean. The seat pad is quick to remove and machine washable which is huge! I hate the process of taking apart a car seat and putting it back together again and many of the seats I’ve had have been tedious in this respect. I would have to guard all the little pieces with my life so none of them would get carried off and lost while the seat cover was in the wash. This seat makes cleaning an easy process. 5- Straps loosen easily and quickly. 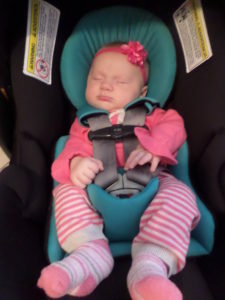 Getting a baby buckled in a car seat is a huge pain if the straps are too tight. Some of the car seats I’ve had in the past were such a pain to loosen that it wasn’t even worth it. I would just struggle through getting their little arms through and their body buckled in. The 5-point harness system with an easy release button makes loosening and tightening the straps quick and painless even with one hand and I love that! 6- It comes with a cover. I have never seen a car seat with this feature and have purchased car seat covers in the past to deal with this problem. 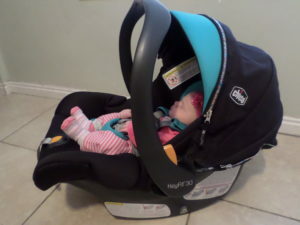 I still use them when I want full coverage in the winter months, but this car seat comes with a cover that covers the lower half of the seat while the sunshade covers the top to protect your baby from the elements. Both easily zip on and off. If you are looking for a fantastic car seat for your new baby– this one will not disappoint! 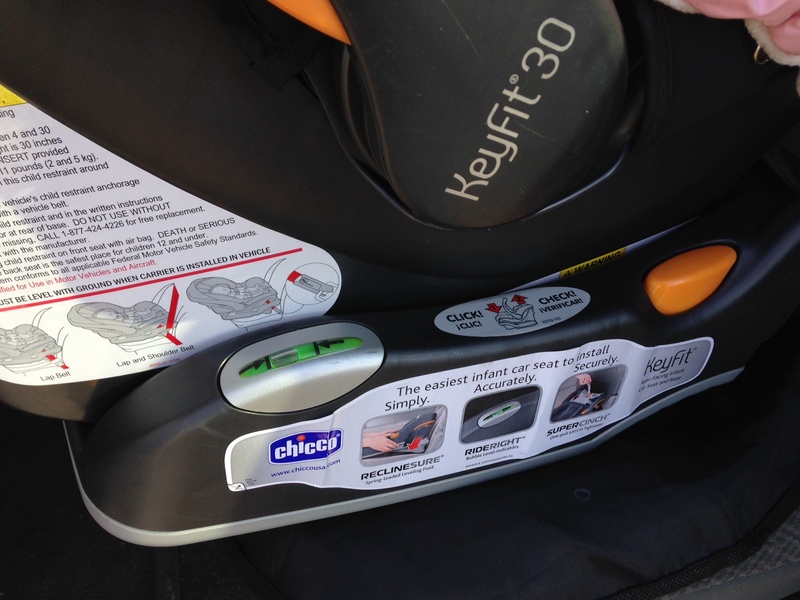 You can find the Chicco The KeyFit® 30 Zip here.